With the government officially moving to take away new worker protections, the 7th annual Workers’ Bowl has become that much more urgent. The OEERC’s fundraiser, in partnership with the Workers’ Action Centre, supports community and leadership programs that better equip workers to take on bad workplace practices. Hundreds of workers with urgent problems at work call our Workers’ Rights Information Phoneline every day. Two seasoned, knowledgeable, and effective organizers, Martha and Milan, are there to answer a wide range of questions. Martha and Milan’s vital contribution is their ability to walk workers through dire problems at work, over the phone and face-to-face. They do essential work in the movement, helping workers transition from their own individual problem to more collective action. This year, we had three amazing organizer interns join our team to learn from Milan and Martha. It’s no easy feat, yet Erendira, Jared and Navi have risen to the challenge of listening to a range of workers’ drastic situations, and helping them take steps to defend their rights. Navi specifically does outreach to Punjabi speaking workers in Brampton, Erendira shares strategies to defend our rights within the Spanish speaking community, and Jared organizes workers on university and college campuses. Like Milan and Martha, they have positively impacted the lives of hundreds of workers dealing with unsafe workplaces, unjust dismissals, harassment, misclassification and unpaid wages. We are extremely proud of our interns and organizers! This training is sustained by supporters like you. 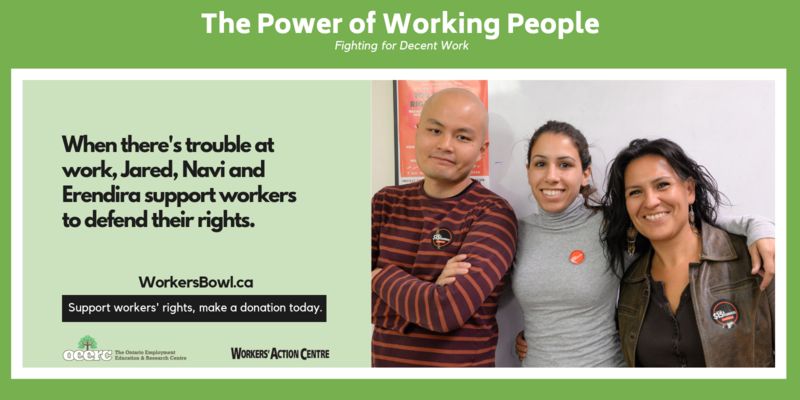 Please consider donating to the Workers’ Bowl. With your help, we can keep training new leaders and helping workers access justice in their workplaces. (Tax receipts are available for donations of $10.00 or more.) Thank you for standing with us, and continuing to share these stories with your networks!